View from the ship of monument in Tasmania. We apologize for yet another late posting at almost 3:00 pm, our new time here in the Tasman Sea in the South Pacific. We overslept after I'd kept us both awake during the night with a hacking cough. This morning upon awakening late I immediately noticed if I've turned the corner and am on the mend. Thank goodness. I didn't want this entire cruise to consist of stifling a dry cough. Tom's abscess is healing and he feels good. We're renewed and refreshed feeling like ourselves once again. We missed breakfast which was fine. After eating two meals a day over the past four full days of cruising I felt stuffed and ready for an intermittent fasting day with a 24 hour reprieve from food. Tom is also avoiding food today, except for his Mudslide, an alcoholic ice cream type drink with vodka, Kahlua, coffee liqueur and Bailey's Irish Cream included in the drink package we both received as a perk with this cruise. Last night, we met some amazing people at our dinner table. I sat next to an interesting and enlightening older couple. He's an 86 year old Anglican priest and she's a spiritual advisor. 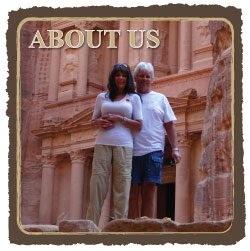 They've both traveled the world extensively. The three of us became engrossed in sharing our philosophical viewpoints on many topics for some highly stimulating conversation. Tom at the martini bar last night. Their warmth, kindness and intellect precipitated my feeling grateful for meeting them. Its these types of interactions that leave us reeling with happiness over the opportunities we encounter while cruising. Tom sat next to an equally interesting couple with whom he became totally engrossed, as well as one more couple at our table. None of us hardly noticed our meals, eating little bites between conversations. With a pending one hour time change last night (with another tonight), by the time we returned to our cabin it was 11:30 PM and we'd yet to change the time on our watches and digital equipment. This morning, when we finally got up and ready for the day it was too late to make it to the dining room before breakfast service ended at 9:30 am. We could have gone to the buffet but, we've avoided this area due to a higher risk of "catching" something. We just returned from waiting in a long queue to check in with New Zealand immigration required of all passengers disembarking in NZ on 19th declaring any food products and where and how long they'd be staying in the country. We had no problem getting our 90 day stamp to stay in the country without an additional visa. Once again, we're back at the Café al Bacio while Tom's savoring his tasty drink and I'm sipping on a my new favorite herbal African tea, visiting with a variety of passengers who stop by to chat. We couldn't be more comfortable or enjoying ourselves more, especially now that we're both on the mend. Tom's "new thing," a crab cake with succotash. The rolling seas are tolerable. We hardly notice until looking out the window and see the horizon moving up and down with the rough seas. Luckily, neither of us ever suffers with seasickness. We'll continue to be out to sea over the next several days. Never bored for a moment, our cruise is comparable to being at one huge cocktail party filled with lively and enthusiastic guests who are highly sociable, friendly and eager to start conversations. Surprisingly for a sea day, the wifi connection is good today even with many passengers also online on their iPads, phones and laptops. Most likely, we'll spend tomorrow morning in our cabin watching the Minnesota Vikings playoff game on TV. We'll be back! Tom took this gorgeous sunrise photo on the Big Island as we wound down our last few days until departing for Kauai. We were prepared to continue on. For more photos and details, please click here.